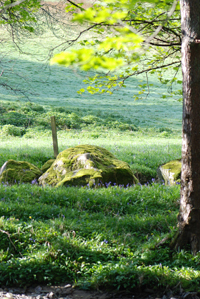 We invite you to come to mystical Ireland for five days of Guided Healing Meditations. 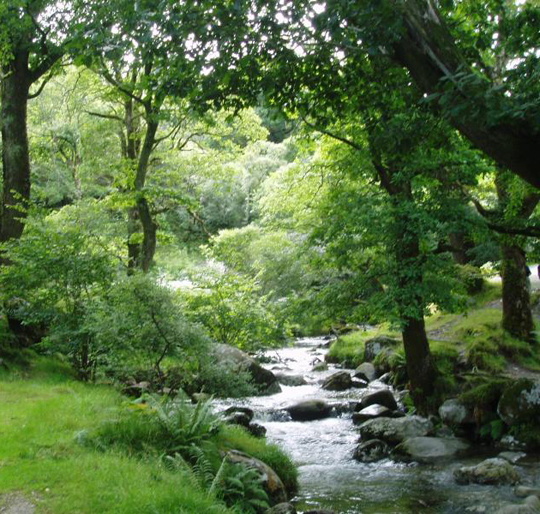 In the capable hands of Drew Lawrence, you will undergo deep transformation and healing in the emerald green Wicklow Mountains nestled in the beautiful Glencree Valley, embraced by a mature growth forest. 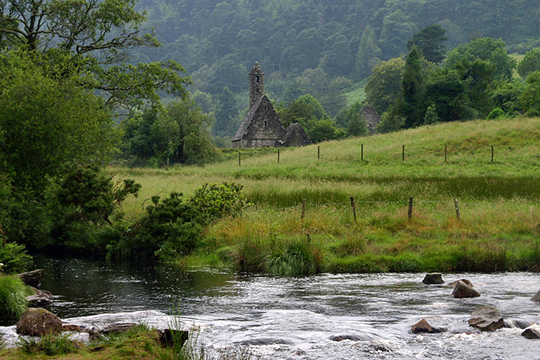 This powerful healing place in the Irish countryside faces due north. According to the ancient Vedic science of Vastu, the northern direction attracts the energies which create transformation, metamorphosis, healing and balance — all through the auspices of the divine feminine. All who visit can feel the resonant, peaceful energies here. Although the name of the house, Whitefield, refers to the one acre field on which it rests, those who come here say it more accurately describes the palpable ‘energetic healing vortex’ permeating the area. You will be guided through one meditation per day, a total of five, by Drew Lawrence. Then you will have the rest of the day to do your ‘homework’ and roam the beautiful, green Wicklow hills on miles and miles of panoramic hiking trails. Please see www.wicklowway.com. Or you can visit the nearby, majestic Powerscourt Estate and gardens. Please see www.powerscourt.ie. You’ll stay in the quaint country village of Enniskerry nearby or in the Ritz Carlton, five star accommodation, also nearby. In the village, we recommend the B&B called Ferndale House.Please visit their website at www.ferndalehouse.com. For the Ritz Carlton, please see www.ritzcarlton.com Most everything you will need is available in the village including bus or taxi service to the center of Dublin. The fee for the 5 meditations is $1500 US. We ask you to book your flight to Dublin International Airport and your room at the B&B or the Ritz Carlton. 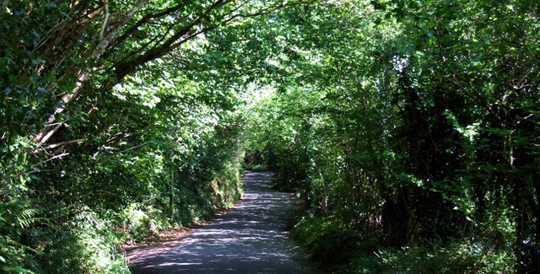 Enniskerry village is about forty minutes drive from the airport. Kalindi will pick you up and drop you off each day for your meditation session at Whitefield. There is no need to rent a car or to drive if you’d rather avoid that. 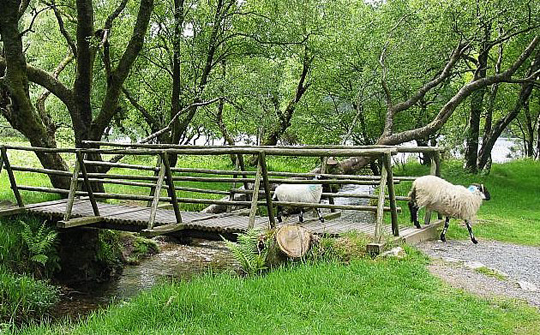 What better place for renewal than the ancient land of the Celts and Druids? My process of internal discovery through your Guided Healing Meditation program is truly bathed in joys of unimaginable proportions. It has allowed me a rebirth, and literally opened my spirit to a new and sometimes startling sense of awareness about myself that never before existed in my life. Drew Lawrence is a consummate, kind, powerful and wise guide for those seeking to go into the dark and painful rememberings of their Souls for loving, forgiving, and releasing of that which does not serve the True Self. I am in awe of his work through his Guided Healing Meditation program. I am profoundly grateful for the self-acceptance and freedom that resulted for me. I don't know where to begin to say thank you for your loving kindness, your easy and flowing generosity, your incredible sweetness, and your incredible thought-full-ness. I had a magical week with you doing Guided Healing Meditation and now that I am back in my old world, I still sustain the sweetness of our time together. I feel that I have had a kind of rebirth. So I send you my thanks and my love. Thank you again for more than you can imagine. Thank you for helping me take the next step in my life journey. My visit to Ireland for the Guided Healing Meditation program was much more than expected. It was like stepping into another universe, shedding all the competing voices of the outside world and embracing so many questions and answers. Drew has helped me tremendously with his Guided Healing Meditation program in Ireland. He has a true gift and uses it compassionately. My heart and soul feel as if the tarnish has been burnished off through this work ... and the natural luster has been restored. Many heartfelt thanks. I must say that our trip to Ireland and the Guided Healing Meditation work that we did with you was immensely influential in triggering a process that slowly began to take shape within me over time. I want to thank you for the role you personally have played in this process of enrichment. You were the catalyst that aroused the spirit that lied buried within me, one that you helped me to unearth. Through the Guided Healing Meditation program, I have integrated a newfound spirit of creativity into my daily life, to my utmost joy and amazement. Your guidance through the Guided Healing Meditation program has opened my eyes to a new awareness, my heart to a new acceptance, and my soul to the infinite possibilities that is its domain, and the universal power that encourages all mankind — the power of enlightenment. I can't thank you enough for all that you have done for me. I am overwhelmed by all of this. I knew I had to come to Ireland and do the Guided Healing Meditation program with you. Now I know why I knew. With love and gratitude. The unconscious or subconscious mind carries all impressions, memories and abilities from childhood as well as from past lives. It contains the lessons, which you have come here to learn in this lifetime in the form of attitudes, beliefs and behavior patterns. Guided Healing Meditation allows you to tap into the subconscious and draw those attitudes, behaviors and lessons to the surface, and at the same time, unlock the vast storehouse which will bring about the fulfillment of your desires and your destiny. Guided Healing Meditation is a process, which can bring you into touch with your subconscious, your superconscious, and the collective unconscious (the beliefs we all share despite cultural or ethnic differences). It is an intermediate state of consciousness which hovers between wakefulness and sleep. Essentially it is a device for tapping the inexhaustible reservoir in which you accumulate anxieties and fears, desires and hopes, during the course of your life. These internal conditioning factors maintain their influence over your external behavior, positively and negatively, throughout your lifetime. During your Guided Healing Meditations you will discover repressed memories from this life as well as past lives, symbolic images, and visions which can be effectively used for investigating and understanding the whole range of your habitual feelings as well as those feelings which you may be unable to experience or express. It is a quick and practical tool for defining the pattern of your emotional responses in two significant areas — your past experiences, and your potential for development. Generally, your libido (creative power) is focused on the external world through the conscious mind. When this creative power is turned inward through the process of Guided Healing Meditation, it causes an increase in memory, dreams and fantasy imagery. Personified images from the unconscious in the form of friends and advisors may appear and offer you sound guidance and profound insights. The purpose of developing these techniques is to acquire tools that you can use to bring about transformation in your life — to bring into being needed changes, to open the lines of communication with various aspects of your self. These aspects of your self will be liberated and given a friendly environment in which they are free to express themselves. This will enable you to fulfill desires, achieve objectives and tap into latent potentialities. You will gain greater knowledge of your "self" and gradually, you will cultivate peace of mind and gain personal fulfillment. Most importantly, you will develop the ability to communicate closely with your higher self (true self) which will allow you to become more independent. This will enable you to solve your problems by going within instead of relying on someone outside yourself. Your dependence on other people, substances, formal religions, dogmas, etc., will gradually be released. The answers to all your questions will become readily available through your own use of Guided Healing Meditation.